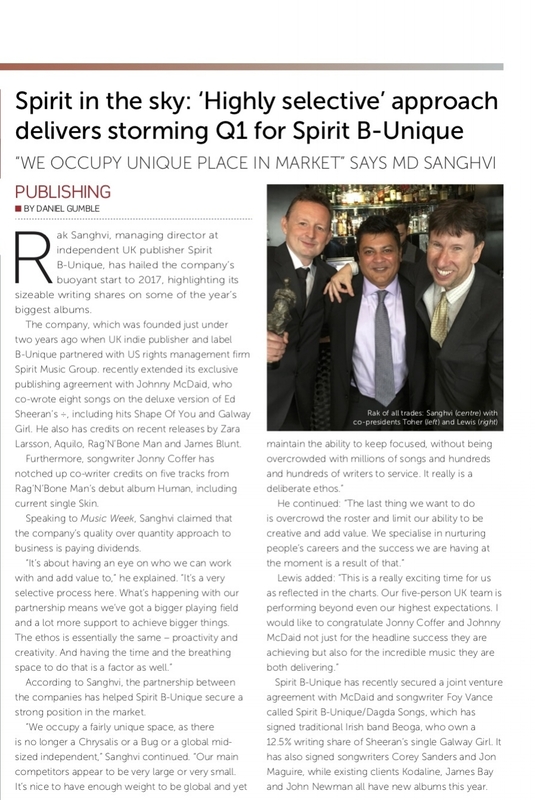 Rak Sanghvi, managing director at independent UK publisher Spirit B-Unique, has nailed the company’s buoyant start to 2017, highlighting its sizeable writing shares on some of the year’s biggest albums. The company, which was founded just under two years ago when UK indie publisher and label B-Unique partnered with US rights management firm Spirit Music Group, recently extended its exclusive publishing agreement with Johnny McDaid, who co-wrote eight songs on the deluxe version of Ed Sheeran’s (division), including hits Shape Of You and Galway Girl. He also has credits on recent releases by Zara Larsson, Aquilo, Rag ‘N’ Bone Man and James Blunt. Furthermore, songwriter Jonny Coffer has notched up co-writer credits on five tracks from Rag ‘N’ Bone Man’s debut album Human, including current single Skin. Speaking to Music Week, Sanghvi claimed that the company’s quality over quantity approach to business is paying dividends. According to Sanghvi, the partnership between the companies has helped Spirit B-Unique secure a strong position in the market. Spirit B-Unique has recently secured a joint venture agreement with McDaid and songwriter Foy Vance called Spirit B-Unique/Dagda Songs, which has signed traditional Irish band Beoga, who own a 12.5% writing share of Sheeran’s single Galway Girl. It has also signed songwriters Corey Sanders and Jon Maguire, while existing clients Kodaline, James Bay and John Newman all have new albums this year.